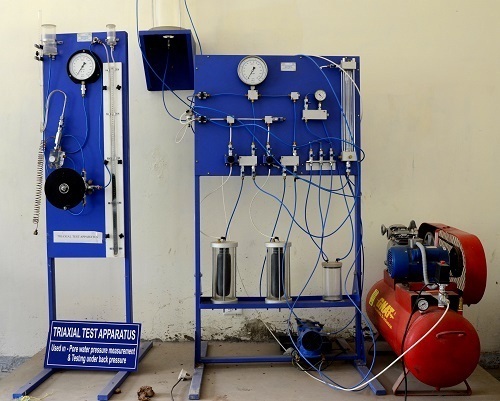 The tri-axial shear test is most versatile of all the shear test testing methods for getting shear strength of soil i.e. Cohesion (C) and Angle of Internal Friction (Ø), though it is bit complicated. This test can measure the total as well as effective stress parameters both. These two parameters are required for design of slopes, calculation of bearing capacity of any strata, calculation of consolidation parameters and in many other analyses. This test can be conducted on any type of soil, drainage conditions can be controlled, pore water pressure measurements can be made accurately and volume changes can be measured. In this test, the failure plane is not forced, the stress distribution of failure plane is fairly uniform and specimen can fail on any weak plane or can simply bulge. Fig. 3: 3.8 cm (1.5 inch) internal diameter 12.5 cm (5 inches) long sample tubes. IS 2720(Part 11):1993 Determination of the shear strength parameters of a specimen tested in unconsolidated undrained triaxial compression without the measurement of pore water pressure (first revision). Reaffirmed- Dec 2016. IS 2720(Part 12):1981 Determination of Shear Strength parameters of Soil from consolidated undrained triaxial compression test with measurement of pore water pressure (first revision). Reaffirmed- Dec 2016. A de-aired, coarse porous disc or stone is placed on the top of the pedestal in the triaxial test apparatus. A filter paper disc is kept over the porous stone. The specimen of the cohesive soil is then placed over the filter paper disc. The usual size of the specimen is about 37.5mm diameter and 75.0mm height. A porous stone is also placed on the top of the specimen. De-aired vertical filter strips are placed at regular spacing around the entire periphery such that these touch both the porous stones. The sample in then enclosed in a rubber membrane, which is slided over the specimen with the help of a membrane stretcher. The membrane is sealed to the specimen with O-rings. 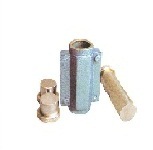 The triaxial cell is placed over the base and fixed to it by tightening the nuts. The cell is then filled with water by connecting it to the pressure supply. Some space in the top portion of the cell is filled by injecting oil through the oil valve. When excess oil begins to spill out through the air-vent valve, both the valves (oil valve and air-vent valve) are closed. Pressure is applied to the water fiiled in the cell by connecting it to the mercury-pot system. As soon as the pressure acts on the specimen, it starts consolidating. The specimen is connected to the burette through pressure connections for measurement of volume changes. The consolidation is complete when there is no more volume change. When the consolidation is complete, the specimen is ready for being sheared. The drainage valve is closed. The pore water pressure measurement device is attached to the specimen through the pressure connections. The proving ring dial gauge is set to zero. Using the manual control provided in the loading frame, the ram is pushed into the cell but not allowed to touch the loading cap. The loading machine is then run at the selected speed. The proving ring records the force due to friction and the upward thrust acting on the ram. The machine is stopped, and with the manual control, the ram is pushed further into the cell bringing it in contact with the loading cap. The dial gauge for the measuring axial deformation of the specimen is set to zero. The sample is sheared by applying the deviator stress by the loading machine. 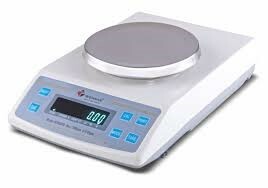 The proving ring readings are generally taken corresponding to axial strains of 1/3%, 2/3%, 1%, 2%, 3%, 4%, 5%, until failure or 20% axial strain. Upon completion of the test, the loading is shut off. Using the manual control, all additional axial stress is removed. The cell pressure is then reduced to zero and the cell is emptied. The triaxial cell is unscrewed and removed from the base. O-rings are taken out, and the membrane is removed. The specimen is then recovered after removing the loading cap and the top porous stone. The filter paper strips are peeled off. The post-shear mass and length are determined. The water content of the specimen is also found. The procedure is similar to that for a consolidated-undrained test, with one basic difference that the specimen is not allowed to consolidate in the first stage. The drainage valve during the test is kept closed. However, the specimen can be connected to the pore-water pressure measurement device if required. Shearing of the specimen is started just after the application of the cell pressure. The second stage is exactly the same as in the consolidated-undrained test described above. The procedure is similar to that for a consolidated-undrained test, with one basic difference that the specimen is sheared slowly in the second stage. After the consolidation of the specimen in the first stage, the drainage valve is not closed. It remains connected to the burette throughout the test. The volume changes during the shearing stage are measured with the help of the burette. As the permeability of cohesive soils is very low, it takes 4-5 days for the consolidated drained test. Triaxial tests on specimens of cohesionless soils can be conducted using the procedure as described for cohesive soils. As the samples of cohesionless soils cannot stand of their own, a special procedure is used for preparation of the sample as described below. A metal former, which is a split mould of about 38.5mm internal diameter, is used for the preparation of the sample (Fig.3). 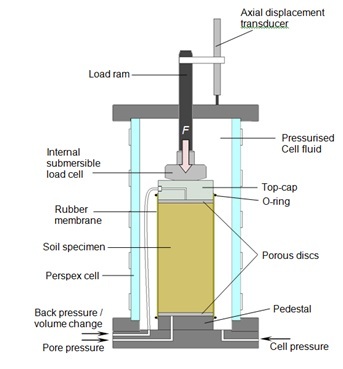 A coarse porous stone is placed on the top of the pedestal of the triaxial base and the pressure connection is attached to a burette (not shown). One end of a membrane is sealed to the pedestal by O-rings. The metal former is clamped to the base. The upper metal ring of the former is kept inside the top end of the rubber membrane and is held with the help of clamp before placing the funnel and the rubber bung in position . The membrane and the funnel are filled with de-aired water. The cohesionless soil which is to be tested is saturated by mixing it with enough water in a beaker. The mixture is boiled to remove the entrapped air. The saturated soil is deposited in the funnel, with a stopper in position, in the required quantity. The glass rod is then removed and the sample builds up by a continuous rapid flow of saturated soil in the former. The funnel is then removed. The funnel is then removed. The sample may be compacted if required. The surface of the sample is leveled and a porous stone is placed on its top. The loading cap is placed gently on the top porous stone. 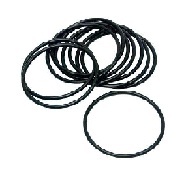 O-rings are fixed over the top of the rubber membrane. A small negative pressure is applied to the sample by lowering the burette. The negative pressure gives rigidity to the sample and it can stand without any lateral support. For sample of 37.5mm diameter, a negative pressure of 20cm of water (or 2 kN/m2) is sufficient. As soon as the negative pressure is applied, the consolidation of the sample occurs and it slightly shortens. The diameter of the upper porous stone should be slightly smaller than that of the specimen so that it can go inside when the sample shortens; otherwise, a neck is formed. The split mould is then removed and the diameter and the height of the sample are measured. The thickness of the membrane is deducted from the total diameter to get the net diameter of the sample. The cell is then placed over the base and clamped to the base. It is then filled with water. The rest of the procedure is the same as for cohesive soils. In consolidated-drained and consolidated-undrained tests, the consolidation of the specimen takes place during the first stage. As the volume of the specimen decreases, its post-consolidation dimensions are different from the initial dimensions. The post consolidation dimensions can be determined approximately assuming that the sample remains cylindrical and it behaves isotropically. Let Li, Di and Vi be the length, diameter and the volume of the specimen before consolidation. Let L0, D0 and V0 be the corresponding quantities after consolidation. Volumetric change is measured with the help of burette. As the sample is sheared, its length decreases and the diameter increases. The cross-sectional area A at any stage during shear can be determined assuming that the sample remains cylindrical in shape. Let ∆ L0 be the change in length and ∆V0 be the change in volume. The volume of the specimen at any stage is given by V0 ± ∆V0. Where, Єl is the axial strain in the sample. The stresses in the specimen at various stages of shear should be calculated using the cross-sectional area A as found above. The deviator stress (σd) is equal to (σ1 – σ3). It may be noted that the load indicated by the proving ring is slightly more than P because of friction on the ram and the upward thrust on the ram due to pressure of the water in the cell. The correction can be determined separately. A more convenient procedure is to lift the ram above the specimen when the cell pressure has been applied. The machine is started keeping the strain rate the same as to be used in the actual test. The proving ring records the load. To account for correction, the dial gauge on the proving ring is set to zero to indicator zero load. This automatically compensates the ram friction and the upward thrust on the ram due to cell pressure. Thus the load indicated by the proving ring during shear would be equal to the load P applied to the specimen. The minor principal stress (σ3) is equal to the cell pressure (σc). The major principal stress (σ1) is equal to the sum of the cell pressure and the deviator stress. The deviator stress at failure (σ1 - σ3) is known as the compressive strength of the soil. Drained Test: Fig. 7 shows the stress-strain curve for a drained test. The y-axis shows the deviator stress (σ1 - σ3) and the x-axis, the axial strain (Єl). 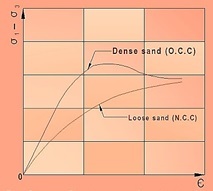 For dense sand (and over-consolidated clay), the deviator stress reaches a peak value and then it decreases and becomes almost constant, equal to the ultimate stress, at large stains. 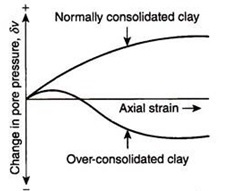 For loose sand (and normally consolidated clay), the deviator stress increases gradually till the ultimate stress is reached. The volumetric strain is shown in Fig. 8. In dense sand (and over-consolidated clay), there is a decrease in the volume at low strains, but at large strains, there is an increase in the volume. In loose sand (and normally consolidated clay), the volume decreases at all strains. (For some loose sands, there is a slight tendency to increase in the volume at large strains). Consolidated-undrained test: Fig. 9 shows the stress-strain curve for a consolidated-undrained test. The shape of the curves is similar to that obtained in a consolidated-drained test. In a consolidated-undrained test, there is an increase in the pore water pressure throughout for loose sand (and normally consolidated clay), as shown in Fig.10. However, in the case of dense sands (and over-consolidated clay), the pore water pressure increases at low strains but at large strains it becomes negative (below atmospheric pressure). 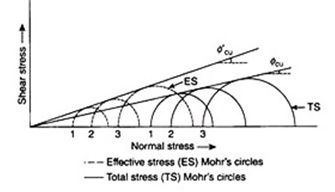 6.2 Mohr Envelopes: For drawing the failure envelopes, it is necessary to test at least three samples at three different cell pressures in the stress range of interest. For dense sands and over-consolidated clays, the failure envelope can be drawn either for the peak stress or for the ultimate stress. 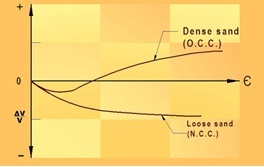 For loose sands and normally consolidated clays, the failure envelope is drawn for the ultimate stress, which is usually taken at 20% strain. Further, the failure envelope can be drawn either in terms of effective stresses or in terms of total stress. Of course, the two envelopes will give different values of strength parameter (c and Փ). The failure envelopes in terms of effective stresses can also be drawn from the results of a consolidated-undrained test (CU test) when the pore water pressure measurements are also taken. The shear strength parameter c’ and Փ’ obtained from the consolidated-undrained tests and that from consolidated-drained test are approximately equal. Drained tests on dense sands and over-consolidated clays give slightly higher values of Փ’ due to extra work required during dilation (increase in volume), but the difference is small, and therefore, usually neglected. The failure envelope in terms of total stresses can be drawn from the test results of a consolidated-undrained test. The angle of shearing resistance Փcu obtained from the total stress envelopes is also known as apparent angle of shearing resistance. Fig. 13 shows the failure envelope in terms of total stress obtained from an unconsolidated-undrained test on normally consolidated clay. The failure envelope is horizontal (Փ = 0) and has a cohesion intercept of cu. In this case, shear strength is S = cu. The failure envelope for over-consolidated clay is also horizontal, but the value of cu will be more, depending upon the degree of over-consolidation. For an unconsolidated-undrained test, the failure envelope cannot be drawn in terms of effective stresses. In all the tests conducted at different confining pressures, the effective stress remains the same. This is due to the fact that an increase in confining pressure results in an equal increase in pore water pressure for a saturated soil under undrained conditions. 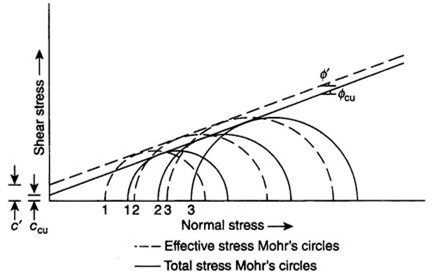 Thus only one Mohr circle in terms of effective stresses is obtained from all the three tests. It may be noted that the deviator stress at failure is the same for all specimens.